View of Boston from the Prudential Center. 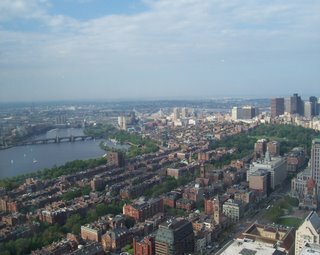 The Prudential Center has an enclosed observation deck near the top of the building that provides a 360 degree view of Boston. The building is about a 20 minute walk from the Back Bay area were we were staying. 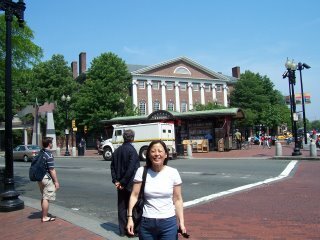 We walked over the Harvard Bridge to the city of Cambridge and then went to Harvard Square to look at the the shops. 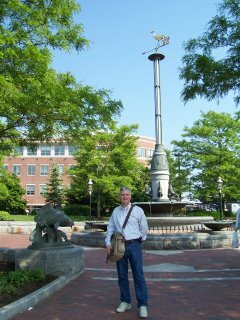 I especially enjoyed being here because Harvard Square is where my favorite NPR radio show is broadcast. The show is called "Car Talk" with Click and Clack also known as the Tappit brothers. On the corner of John F. Kennedy and Brattle streets there is a sign that reads Dewey, Cheetham, & Howe (read it out loud). Car Talk is broadcast from there on the third floor and on their show they always say that their attorneys are Dewey, Cheetham, & Howe. After all that shopping, Catherine needs a break. Actually I needed a break, Catherine never needs a break from shopping. 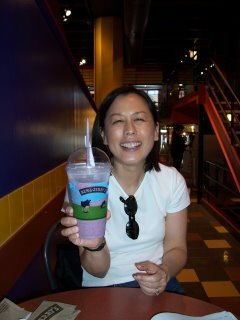 Later on this trip we went to Burlington, Vermont the home of the original Ben & Jerry's. Here Catherine decides to do a little pre-trip research. 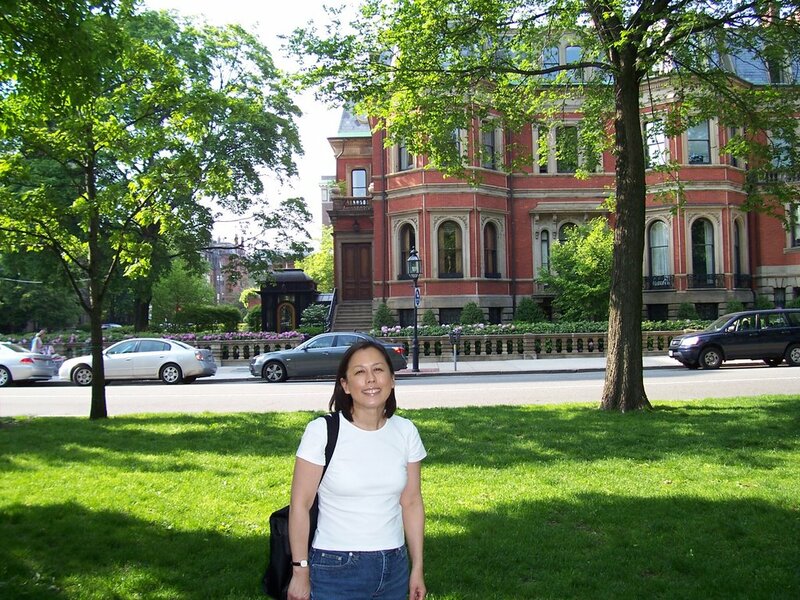 In the background of this shot is some typical Back Bay area architecture. View from the Marriott Residence Inn in Boston on the Tudor Wharf. The last part of our trip in Boston we stayed at a Marriott Residence Inn. It was really nice and very clean and included a complete kitchen; stove, refrigerator and dish washer. As you can tell it also had great views of the Boston Harbor. 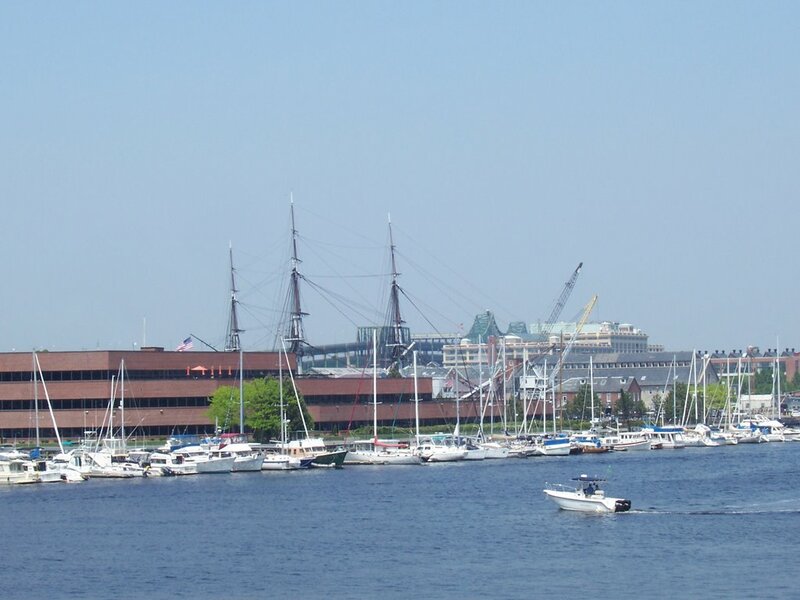 A scene of the USS Constitution "Old Ironsides". 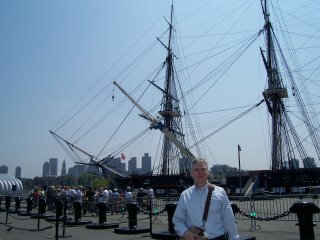 Just a few minutes walk from our new hotel was the USS Constitution. 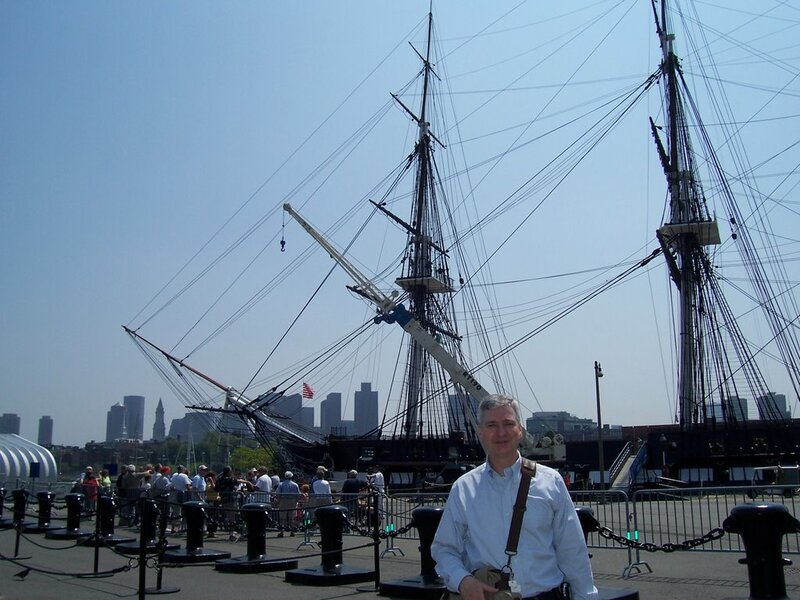 The USS Constitution is one of the U.S. Navy's first frigates. She was launched in 1797 using bolts, spikes, and other fittings from Paul Revere's foundry. She played a key role in repelling the British in the War of 1812. She earned her nickname "Old Ironsides" during a battle on August 19, 1812 when shots from HMS Guerriere bounced off her thick oak hull as if it were iron. U.S. Naval Sailor and USS Constitution guide. 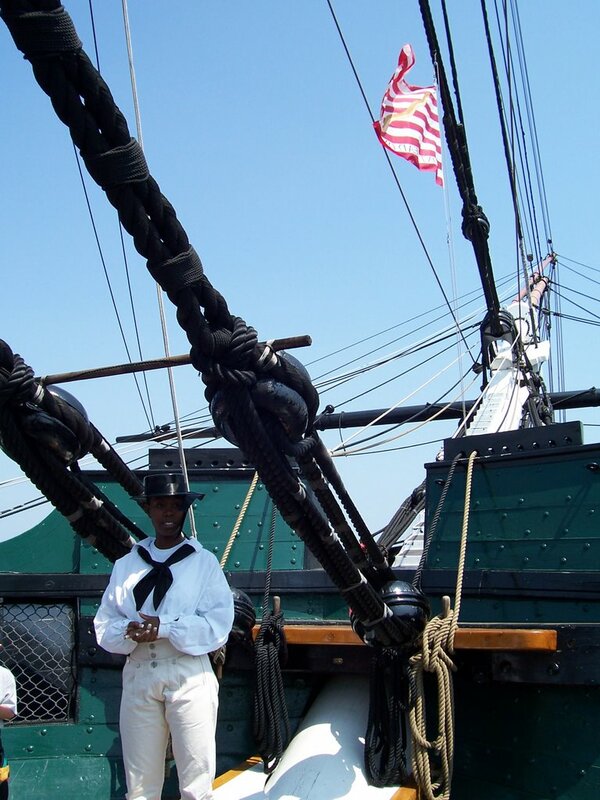 I spoke with the USS Constitution guide pictured above and she told me that all the guides are active duty U.S. Navy sailors. They are selected during boot camp and offered a chance to spend six months as a guide before they continue in their Navy service. Being selected is considered to be a high honor. The sailor pictured above said she was going to Navy "A - School" to be a hospital corpsman. 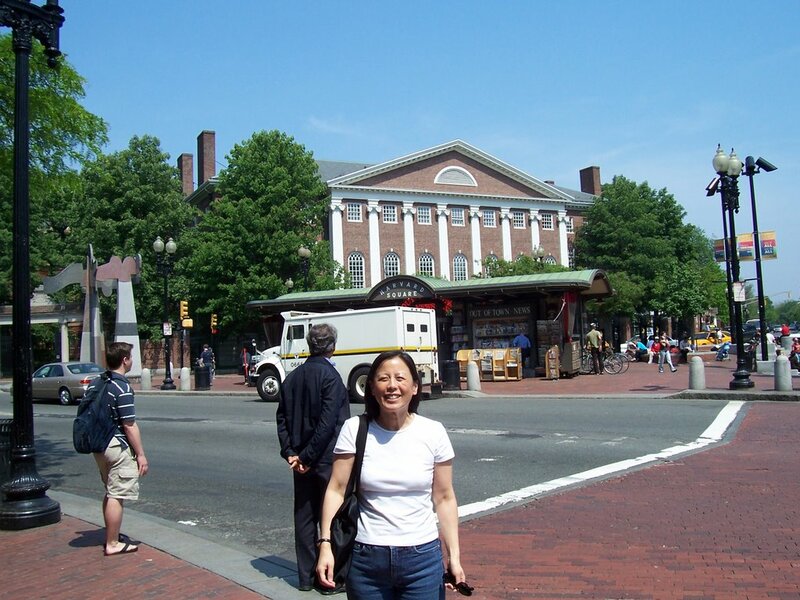 Anybody recognize this lady? 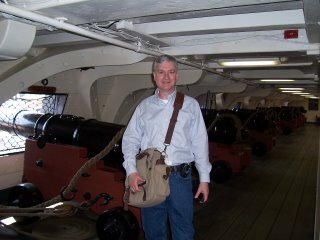 That's me on the gun deck of the USS Constitution. 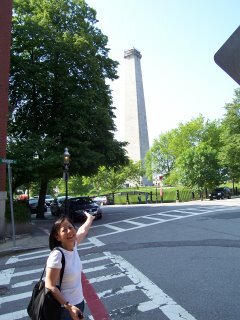 Catherine points the way to Bunker Hill. 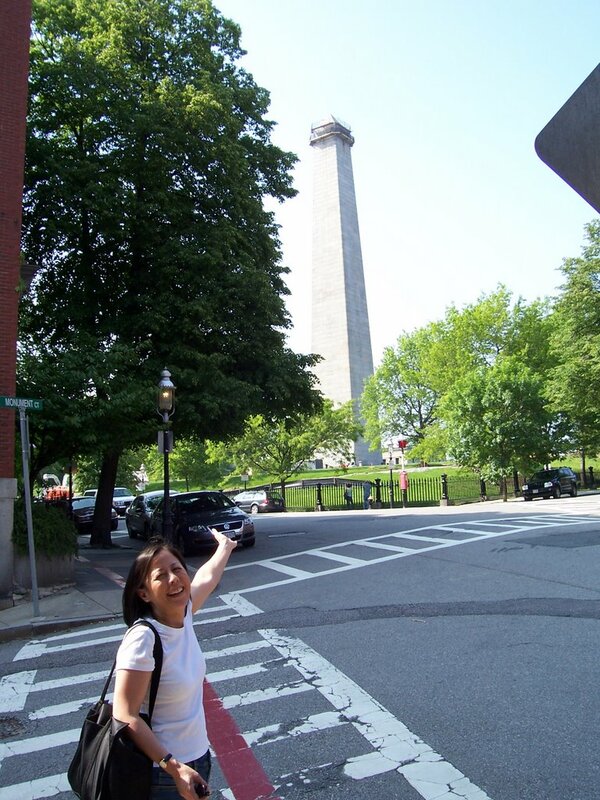 This 221 foot granite obelisk is in honor of the colonists that died in the Battle of Bunker Hill on June 17, 1775. The rebels lost the battle, but nearly half of the British troops were killed or wounded, a loss that contributed to the British decision to abandon Boston nine months later. The Marquis de Lafayette, the hero of the American Revolution, helped lay the cornerstone of the monument in 1825 and is buried in Paris under soil taken from Bunker Hill. A view of a neighborhood along the Freedom Trail as it leads away from Bunker Hill. 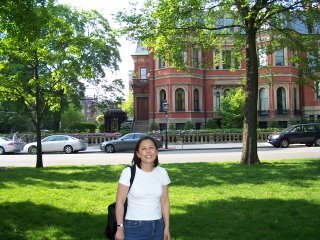 A small park along the Freedom Trail near Bunker Hill. Catherine at Giacomo's Ristorante in North End neighborhood. 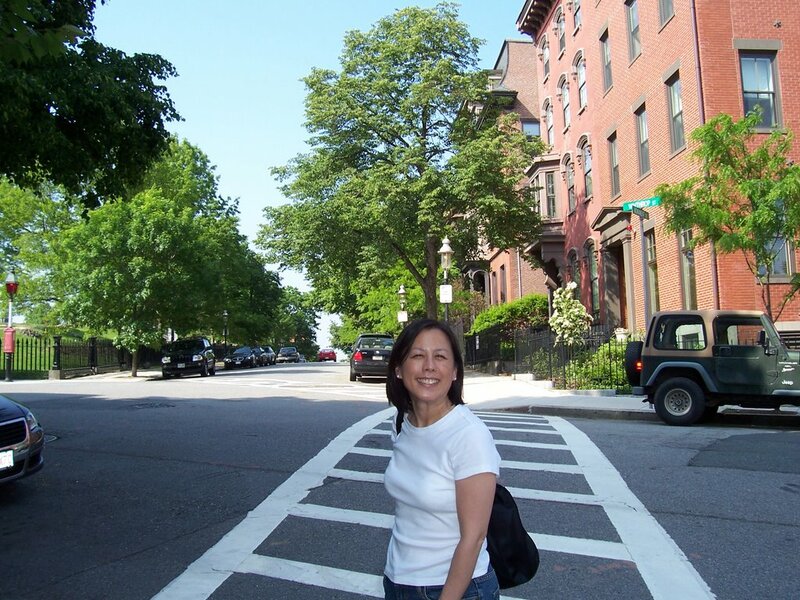 At the end of one of our day walking the Freedom Trail, we ate at Giacomo's Ristorante. No reservations are taken and there is always a line waiting outside, but is worth the wait. Once inside you choose the meal off a board on the wall by selecting from the various pastas, sauces, and meats you want. For example, a little tortellini, with a tomato sauce, and scallops. There was only the two of us so they sat us with another couple. He was from Boston and the lady was his Mother-In-Law that he had just picked up from the airport. They were very friendly as were all the Bostonians that we encountered. 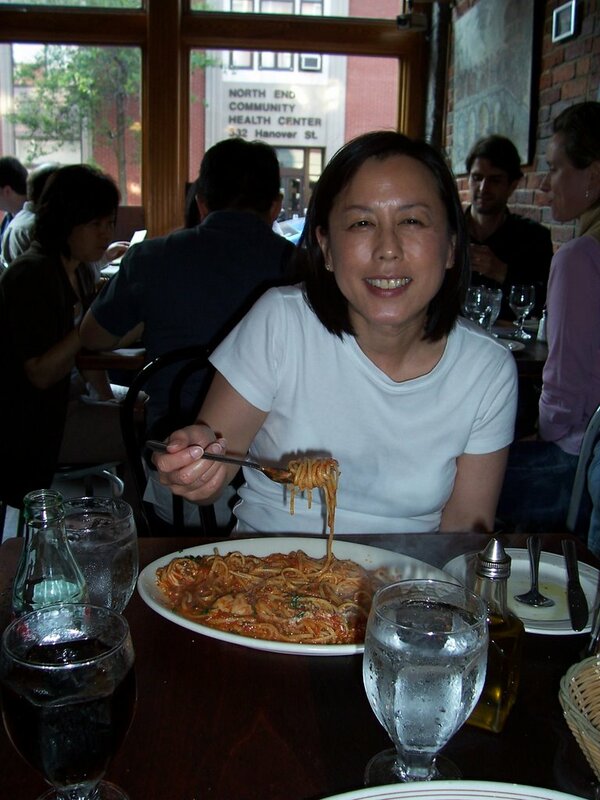 Later, when we were home, we watched Rachel Ray the television chef and she went to this same restaurant on her show. She sat in the same table that Catherine and I had our meal. We both got a big kick out of seeing the restaurant again. I stumbled into your blog and really ejoyed it! I live in Boston and it was great to see all of your pictures. So glad that there are people out there enjoying our awesome city.